It’s time to announce the winners of our Winter Holiday Challenge, sponsored by Simon Says Stamp! Number 30 was submitted by Lucie, and it’s a beauty! Congratulations Lucie, please contact us so we can get your information for your prize from Simon Says Stamp. As mentioned in the Challenge blog post, we also have a die from Simon Says Stamp for a random winner, so let’s see who won that! Trina P! Step right up, you’ve won the Sensational Snowflake Collage die from Simon Says Stamp. Please email us at ablognamedhero@gmail.com to claim your prize. Include your mailing address and I will get this out in the mail straight away. Betty’s Poinsettia is gorgeous! Fantastic coloring. 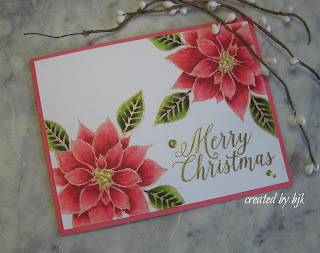 Ann’s beautiful card with classic Christmas colors. That’s it for us for this year. We hope you all have a wonderful and happy, and most importantly healthy 2018. We have many changes coming next year to the blog, and they’re all going to be amazing. We are very excited. Don’t forget, we have a Design Team call happening, you can get all of the details here. We just wanted to post a reminder that we’re having a Design Team Call for 2018. And you know… mention one little thing. We are now the Official Challenge Blog of Hero Arts! So, make sure to get your application in, deadline is January 10th, 2018, 5pm EST. Swapna here with my post for this month. This month we are collaborating with amazing Simon Says Stamp using their fabulous Diecember release. Inspired by this month’s challenge I have created Winter Holiday Birthday card. I die cut a snowflakes several times from white card stock and sky blue card stock. Then I applied versamark ink and heat embossed with Judikin’s Iridescent embossing powder. I glued white snow flakes towards top of the folded a2 card base. I stacked 3 blue snowflakes and heat embossed with Judikins Iridescent embossing powder. I die cut another panel with Hero Arts Postage Stamps Infinity die and foam mounted on the card base. Glued blue snowflake on the panel and stamped sentiment. Sentiment is from Hero Arts Birthday Messages. Here is closer look at the sparkle and dimension on the snowflake. Here is closer look at the white snowflakes. Wish you all A very Happy New Year in advance. Hope to see you all in 2018. Good morning! Emily here with you today for my last post for A Blog Named Hero for 2017. (Seriously, someone tell me where the year has gone, because it’s just not possible that it will be 2018 in a week.) I wanted to do something super fun and festive for a Christmas Day post, so what’s more festive than the North Pole train station?? This card is beautifully flat, aka easy and inexpensive to mail, but still has lots of detail and dimension from a few tricks. Let’s get started with the details! This card uses the holiday My Monthly Hero kit from this past October… so many darling little bits and pieces in this stamp set; you could go several different directions that aren’t just towards Santa and the North Pole! But, for this Christmas Day card, I wanted to focus on the adorable little train station and Santa train. I started by stamping the train and the train station onto some masking paper, then fussy cutting them out. When creating a little scene like this, I determine which image would be shown in its entirety as it’s closest to the front of the scene, in this case the train, then all of the other images go behind it. I stamped the train on a piece of watercolor paper using Hero Arts Intense Black ink, then placed my mask over the top and stamped the train tracks and the train station. I then placed my mask over the train station as well and stamped the trees that would be behind the train station. I love removing masks; it’s like magic! After I finished stamping all of the images, I began watercoloring with my Zig markers and damp paintbrush. When the watercoloring was dry enough, I used a snow writer pen to add some dimensional “snow” to a few areas on the building, ground, and festive Christmas tree. I trimmed the A2 watercolor panel down 1/4″ and mounted it on some red card stock to make a pretty frame. Nice and flat, aka easy to mail. Well, that’s all for me today… and my last post for 2017! I hope you’re having a wonderful holiday weekend with your loved ones. Merry Christmas and Happy New Year! Hello, everyone! It’s Melissa, back with a final post for 2017! How the year flew by! Our Winter Holiday challenge is still going on until December 30th, so I used a combination of Hero Arts and Simon Says Stamps sets to create a clean and simple holiday design. I stamped one of the snowflakes from the Simon Says Stamp Frozen Fractoids set in black off the edge of the white card base. I then stamped and die cut the large, colored sentiment using the Hero Arts Wonderful set and coordinating dies. The die cut word was then adhered directly to the card base. I then stamped the smaller words above & below the die cut. To finish things off, I applied a little layer of sparkle to the die cut word using a clear Wink of Stella brush marker. So simple and perfect for those last minute holiday cards! Have a wonderful holiday and don’t forget to link up your own card by December 30th!